This is an update on the partnership between the Janesville Noon Lions Club, the Janesville Velo Club, and Michael’s Cycles to repair bicycles owned by the Wisconsin Center for the Blind and Visually Impaired. We are pleased to report that we recently were able to deliver bikes No. 4, 5, and 6 to WCBVI. 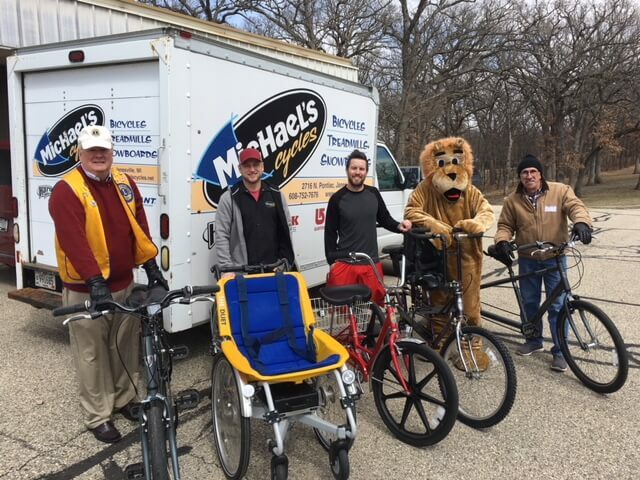 Pictured above making the delivery are, left to right, Lion Dennis Steed, Hans Genrich of Michael’s Cycles, Dustin Andrews of WCBVI, Lion Blaine Vance (dressed as Lorenzo), and Devan Dutra of the Janesville Velo Club. During this trip we also picked up bikes No. 7, 8, 9 and 10 to be taken to Michael’s for repairs. These are the final four bikes in the WCBVI fleet. The Lions Club and Velo Club contributed financially to the project, and Michael’s provided repairs at a reduced rate. The Lions Club is pleased to have been a part of this effort to combine our mission of vision-related issues and community service to make this project a reality.